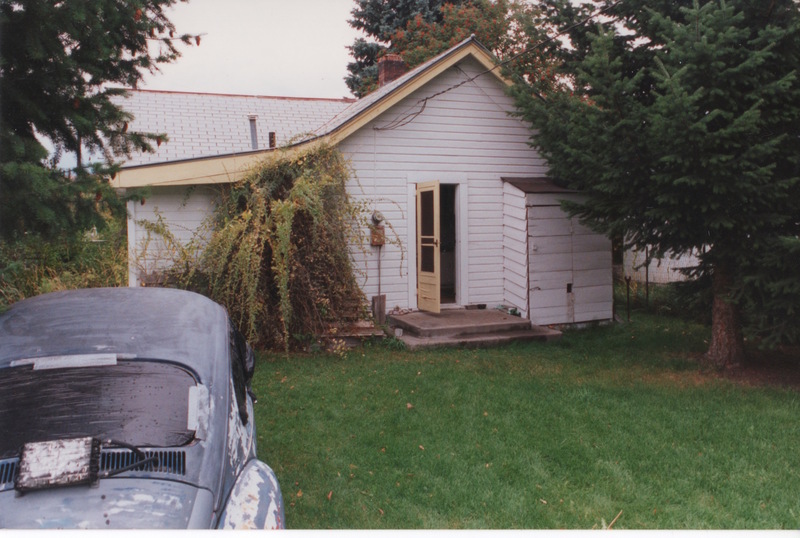 Looking through old photographs that I catalogued by date, I found 31 color photos from early September, 1997. My brother Tom Struckman died then, 53 years old. A couple of weeks before that, our nephew Geoff Angel had telephoned me from Missoula to tell me Tom had severe chest pain. He knew because Tom had asked Geoff to help him return a copy of Adam Smith’s book,”An Inquiry into the Nature and Causes of the Wealth of Nations (1776), usually abbreviated as The Wealth of Nations.” Tom had practically no money, but was interested in it as a social phenomenon. Anyway, Tom had gotten the book from a Missoula bookstore, but was disappointed that it was an abridged edition, so he was returning it. Geoff also helped Tom get a wool blanket for his bed to use as a mattress. His wooden bed had sublime, but simple, craftsmanship. It also had a plywood deck for sleeping. Like I said, Geoff called me from Missoula because Tom had complained of the chest pain that had lasted many days. He told me that Tom had taken so many over-the-counter pain remedies that his ears rang. Tom had no telephone, so I phoned the Missoula police to ask them to check on Tom. I got no report back, so I phoned the police again the next day. Someone there said that Tom had told the police officer he was just fine, so the officer left. I asked Geoff to tell Tom that a doctor at the emergency department could treat him with a drug. Later, Geoff told me that Tom said, “There’s a drug? Let’s go!” Soon he had been admitted for a heart attack that had destroyed about a third of his heart. The people in the ER told him that he had been misinformed about the drug. It was far too late, they said. No use giving him any hope, I thought. Anyway, I had been thinking morphine—palliation, not a clot-buster. Geoff visited Tom the next day after he had been admitted to the hospital. Geoff said that Tom was tuned into the pathophysiology of a myocardial infarct, but also philosophical, wondering about losing a third of his heart, the center of his emotions. Tom had mentioned hearing the sound of his own heart on a doppler when he was undergoing tests. My nephew Jon Angel spoke to Tom in the hospital by phone and he said he seemed reasonably chipper. I also telephoned Tom as soon as I heard about Jon’s success, and I heard his voice answer hello. “Hello!” I said, “Tom it’s me! It’s Dan! How are you?” I heard a clunk, then a dial tone. Hurt my feelings, sank my hopes. That evening Jon told me the next day he was going to Missoula with his 1-year-old son, Bradley, and he insisted I go along. “Well, he hung up on me,” I protested. But I went. We got to Tom’s house on Missoula’s north side the following afternoon. I knew Tom used smokeless tobacco so I bought a generous supply as a gift. Jon just barged in through the back door, and I followed. I sat across the room from Tom who sat on his bed and to my surprise he didn’t object. Turns out Tom had dropped the phone and didn’t know that it was me. We talked. We reminisced about our days working for the Northern Pacific railroad. Tom didn’t want the chewing tobacco. “Causes heart attacks,” he said. He showed me his two medications: lisinopril and nitroglycerin tablets. Tom said he wouldn’t take the nitro because he wouldn’t need it. Tom said he tried to dig in his garden but he felt so short of breath and weak he had to stop. I promised Tom we would come back when he felt stronger. I was amazed that he was alive after such a massive heart attack. We shook hands all around and Tom made a saluting gesture toward me as we departed. I told him I was glad to be his friend again. We spent the night with my oldest son Todd who was staying by himself in Missoula because his fiancé was out of town. Jon and I slept in their bed and Bradley vomited on us in the night. The next day Bradley had such a foul-smelling diaper on the road back to Billings that I nearly vomited when we stopped near Big Timber. Nonetheless I was elated. Mark Fryberger phoned me a couple weeks later: “Tom died,” he said simply. Mark said he had an extra cat and wanted to check with Tom to see if he was still between cats. When Mark looked through the back door window he thought he saw a scarecrow on the kitchen floor, so he opened the backdoor. Then Mark called the police. I thanked Mark. Our daughter Clara was home with me and we cried. Later that day Todd phoned me. He had helped put Tom’s body in a box. Tom’s body was decomposed, full of maggots, putrid smelling. Todd said he went to Tom’s and encountered a pair of guys from a mortuary who told him to go home and leave everything to them. Todd said he started to leave, then realized he didn’t have to do as they said. In the end Todd stayed at Tom’s until late, scrubbing the floor, then scrubbing the steps leading into the cellar. Tom’s body had lain on the trapdoor. I started to ask Todd if the body belonged to someone else, but he quickly disavowed me of that. Much later, I asked Todd about his experience. He said he felt it was an intimate experience with Tom and a great honor and responsibility. Perhaps that is why Todd eventually studied medicine after completing his master’s in fine arts in poetry. Todd asked us to come to Missoula because he didn’t want to spend a night home alone after cleaning up Tom’s house. We drove to Missoula that night. At Tom’s some scented candles were still burning throughout the house. It had the cloying putrid smell of death. A rubber glove lay on the ground near the gate to Tom’s backdoor. We snuffed the candles. I walked over to Mike Fiedler’s house the next day to tell him the news. I made numerous phone calls. We had phoned lots of family and friends to tell them about Tom. Tom’s daughter, Hannah, was angry with me for not telling her when Tom had the heart attack. Lots of family came to Missoula. My sister and her family from Nebraska. Hannah and her family from Yakima, Washington. People from Missoula. Our aunt Corinne from Kalispell. Todd’s siblings from Berkeley and Billings. Most stayed with Geoff, except Hannah and her family stayed at a motel downtown. We ended up sending most of Tom’s stuff home with her and Jason in a rented truck. Other stuff got divided up among everyone else. 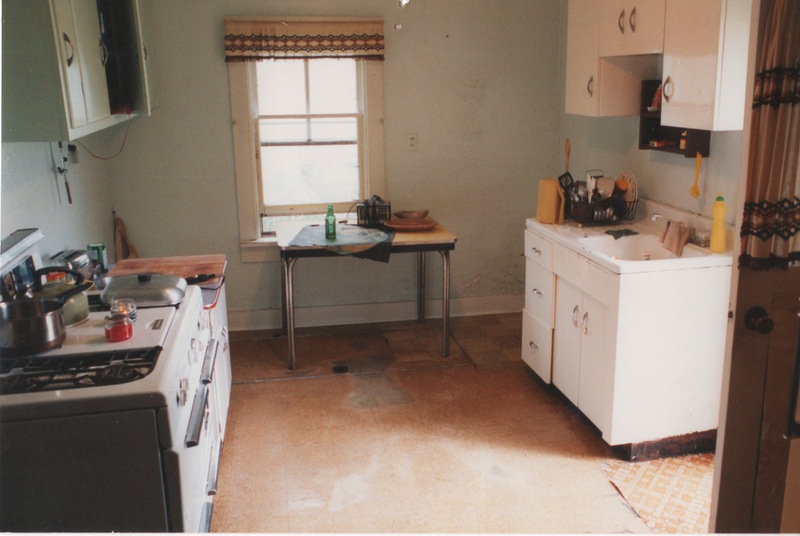 The 31 photographs show what Tom’s house looked like before we emptied it. Tom had been a recluse for nearly 20 years, living with schizophrenia, untreated. He was a voracious reader. He made cassette tapes for his nephews. He raised vegetables, he made things in his wood shop. Todd said Tom’s desk light was on when he died. Looked like he had been applying for heat aid when he walked into his kitchen and collapsed on the floor. His body was spread eagle. We could see his imprint on the linoleum where Todd had scrubbed with an abrasive cleanser. Tom’s image showed as a light-colored area on his floor. Tom’s life was remarkable for a number of reasons. He lived humbly, yet had a monumental ego. He told me that he didn’t believe in God’s existence, but took responsibility himself. “Isn’t that noble?” he asked. He was well-educated, not quite achieving a master’s in English from Eugene at the University of Oregon. I think I’ll write more about Tom later. He was 5 years older than I, prone to pummeling me, but he inspired many. He lived with a certain elusive feeling. He read a book about swimming, then used it to learn to swim. He did the same with drawing, skating, riding a bike, juggling, building musical instruments, carving classical statues from soap, and playing classical guitar. 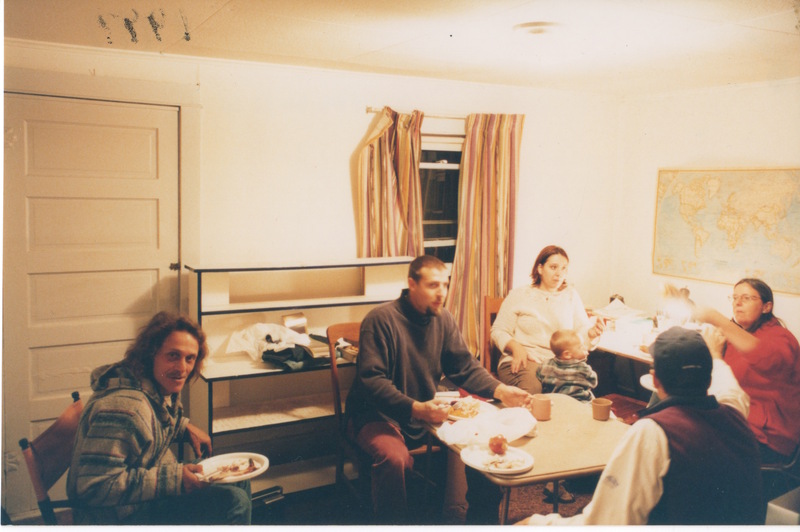 The next night we prepared a meal in Tom’s kitchen to remember him. From L: Mike Fiedler, Jason Wild, Hannah B. Wild, their son Jacob, Bob Struckman (with back to camera) and Penny.